Behemoth textbooks do little to help students truly learn. Originally a respected textbook publishing company, in 2014 Cengage Learning was ready to disrupt the deep-rooted traditions of higher education. Far ahead of their competitors, Cengage recognized the future of education did not include bulky textbooks, it would be a digital future where the classroom was brought to the student. 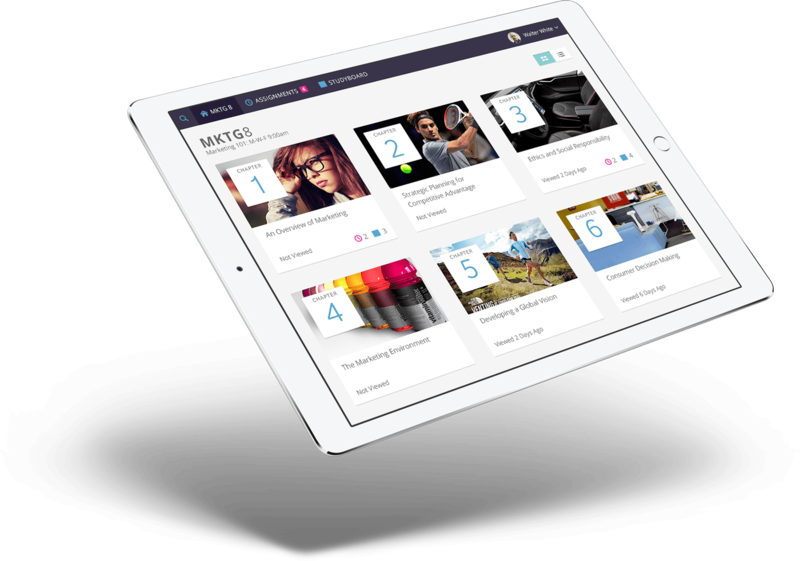 Cengage approached us with a vision to craft an educational app design that would make studying course materials focused, customized, and convenient - ultimately turning traditional textbook learning on its head. We jumped at the chance to bring higher education into the digital age. The textbook publishing industry is built upon one gigantic flaw. For all of history, textbooks were written, published, and marketed toward faculty alone. Faculty were the target purchaser of textbooks, however they were not the end users. This approach left the student (the actual user of the product) completely ignored. From the start, Cengage dove deeply into the student persona - using ethnographic studies as well as a generational investigation into the needs, wants, motivations and learnflow of the modern student. We spent days absorbing the research: What’s important to students? How do they learn? What were their current studying methods? What was missing? These insights were critical in the mission to craft a digital learning experience with the student perspective front and center. The research uncovered several must-haves. First and foremost - guaranteed privacy. Students did not want instructors able to view their every click, their time spent in the application, their quiz results, or any individual data whatsoever. In an era of artificial intelligence and adaptive learning, students also made it clear they wanted full control over their studies. They didn’t want a machine deciding what they should study or be tested on. With a clear picture of what students were seeking in a learning tool, it was time to put our ideas up on the wall, followed closely by a working prototype. It all began to take shape - a web application that would house all the content of a textbook, divided into learning modules, with fully-interactive text, meaning a student could highlight a section as important, or save it as a “StudyBit” for closer focus later. Beyond that, the tool could craft customized flashcards and quizzes, focusing only on the student’s chosen areas to maximize the effectiveness of study time. With a solid prototype under our belts, it was time to put it to the test. Our first user test was at Bunker Hill Community College in Charlestown, MA. Testing revealed a few issues with label word choice as well as a slight disconnect students had when navigating from the Chapter Reading and Study Board sections. We designed improved variations on the spot, tested again, and found the newest iteration to be much more intuitive and smooth. Our second test, at the University of Northern Kentucky, helped to solidify these decisions and dig further into the nuances of the study tools like Practice Quizzes as well as the idea for an Activity and Concept Mastery view. 4LTR Press Online, as the tool became named, also had to be designed with the teacher in mind. 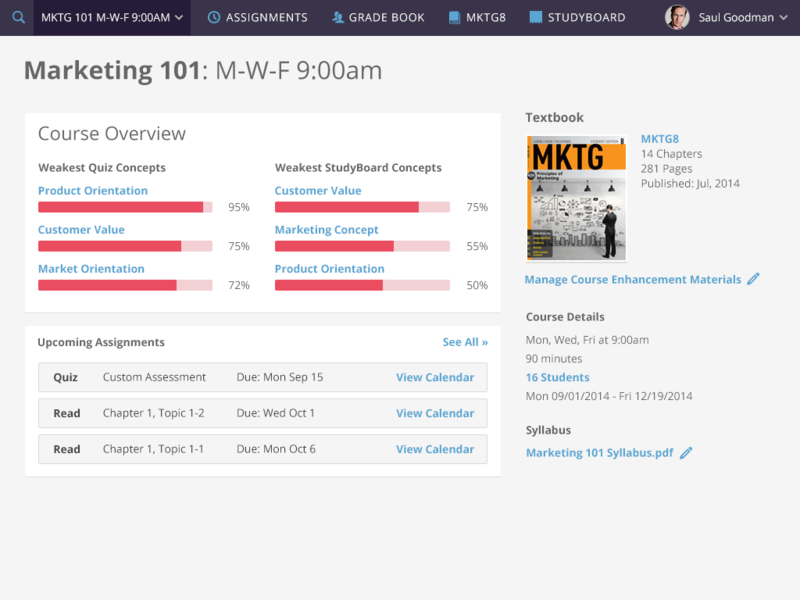 Teachers needed to be able to seamlessly set up courses, manage users, assign work, and assess student progress. Using insights gained from teacher interviews, we mapped out their needs to intelligently design the teacher interface. At the conclusion of the project, we delivered page designs for the entire 4LTR Press Online experience. 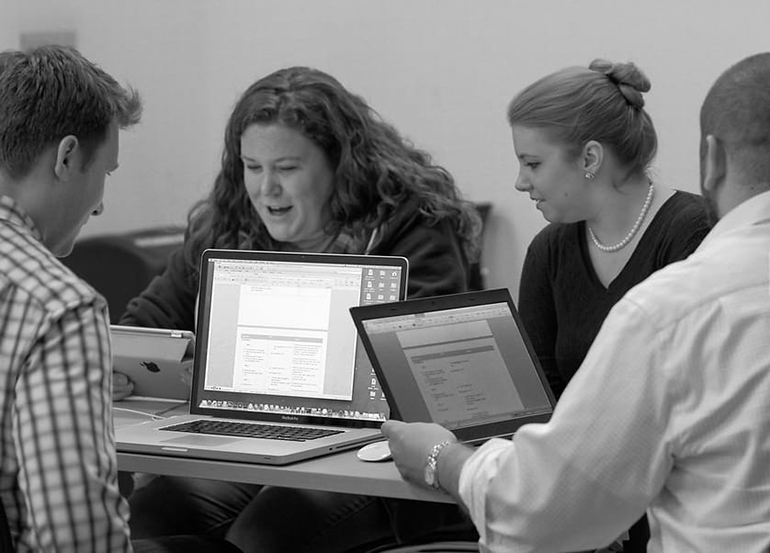 The engagement was much more than mere experience design, it was a truly exciting collaboration challenging the long-held traditions of higher education. 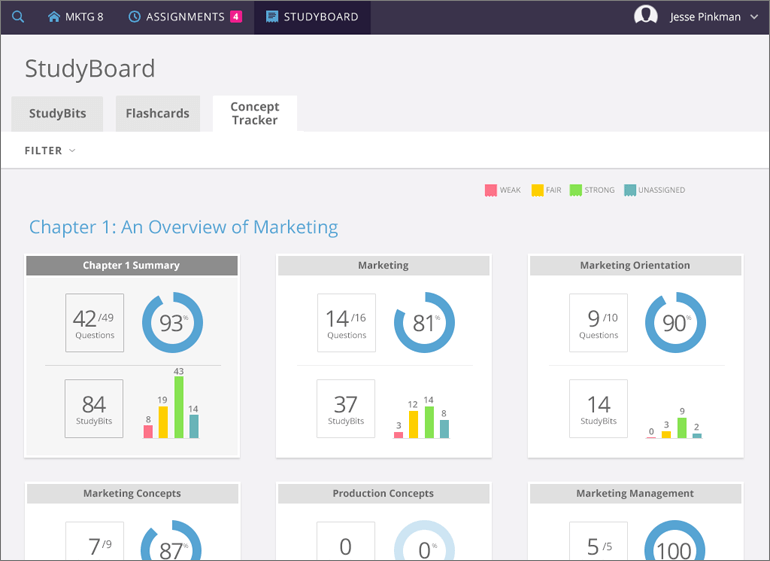 Side by side with the team at Cengage, we built a revolutionary learning tool that brought the student experience into focus for the first time. The first two textbook editions to be sold in conjunction with the 4LTR Press Online platform were Marketing and Psychology. Immediately upon release, sales for these two editions increased by 20%. In addition to boosting sales, 4LTR Press Online became award-winning in the digital product design community. As ultimate proof of the disruptive nature of this innovation, the release of 4LTR Press Online resulted in Cengage’s competitors McGraw Hill and Pearson both scrambling to release their own digital learning platforms in subsequent years.